On a recent trip to Southern Utah I decided to stop in at a local Archery Shop, TNT in St. George Utah, and try out some Bowtech bows. I was able to shoot both the Invasion CPX, and the Assassin. 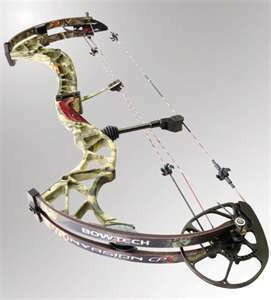 In this review I will focus on the Bowtech Invasion. The bow I shot was set to 70lbs, and had a 29 inch draw length. It was equipped with a Rip Cord Drop Away rest, a generic stabalizer, and a generic sight. The bow has a very very abrubt end to the draw cycle, it literally feels like your drawing elbow hits against a wall, and stops. The draw is smooth up until this point. When it does drop into this VALLEY and stop it stays there with ease. Some may be concerned about this pop into the full draw, but I liked it. There was NO wiggle room at the end. I found the bow to be very balanced in my hand, and it was easy to keep the pins on the target. This bow felt more like a 35 inch bow in regard to my ability to hold on target. I really tried to focus on how the bow felt when I released. I was pleased to feel virtually no hand shock, no jumping. I did feel some vibration, probably more than I felt in the Hoyt CRX 32 I shot. This vibration was not an issue however and I am sure would have zero impact on accuracy. I really like the idea Bowtech has, concerning slaving the cams together. The TNT guys assured me that this was the easiest bow to tune that they sold. The cams, according to literature, cannot come out of timing. This is a cool add, and not the case with other bows. Overall I was very pleased with this bow, it is cool looking, shot great, is fast fast fast, and felt good on the shot. Time will tell how durable.